Five artists get together to express their pleasure in the simple joys of domestic life. 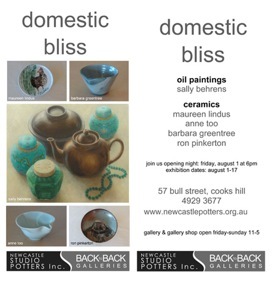 Barbara Greentree, Maureen Lindus, Ron Pinkerton and Anne Too work with ceramics. Maureen’s drawings of pets and chickens on plates are inspired by her love of the home and garden. Barbara’s bowls nestle together in happy pairs or small groups like families. Anne’s gentle celadon glazed porcelain bowls remind us of handmade, pre-melamine times and Ron’s ceramic milk and cream bottles bring to mind the era of domestic life before cardboard and plastic. Working in oils on canvas and usually small scale, intrigued by light and shadow on solid objects, Sally Behrens likes the challenge of making a simple domestic still-life become interesting. Sally builds up an arrangement where lighting sets the mood and creates interest with patterns and textures, sometimes birds and animals are added too. The show opens at 6.00pm tomorrow & & runs until Sun 17 Aug.